I know, I know. These look more like a Peanut Butter Cup than a Kit Kat Bar but without a proper chocolate mold this was what we came up with! These gluten free Kit Kat “Bars” taste like the real thing. The secret is getting the chocolate to filling ratio just right! And they aren’t that difficult to make. No oven required – just a blender and a microwave. We posted this recipe last Christmas but thought we’d post it again for the upcoming Halloween Season. These would be great treats for your ghosts and goblins at any gf halloween parties! For a dairy free (and all-around healthier) version, check out the recipe at Fork and Beans that inspired our own. TIP: We used President’s Choice milk chocolate chips and microwaved them on medium for 2 minutes, then stirred them until they were smooth. Place Rice Chex in a bowl and crush them with your fingers into medium-sized pieces. Using a pastry bag (or make your own with a plastic bag, see here), cover the bottom of each cup with about a tablespoon of melted chocolate. Take a pastry brush and brush some of the chocolate partway up the sides of each cup. This will make the bottom and sides of your candy bars. Into each chocolate cup, put about a tablespoonful of the crushed Rice Chex. Place cups in fridge. Put cashews/almonds in blender and pulse to chop. Now add cocoa, Nutella, vanilla, corn syrup, milk and butter. Blend on high, stopping to scrape down the sides periodically, until smooth and fluffy – about 4 minutes. Remove chocolate cups from fridge. Pour the chocolate fluff into a pastry bag and carefully squeeze a layer into each cup. Add another layer of Rice Chex. Finally, top the cups off with another layer of chocolate. Place in refrigerator to harden. Enjoy! 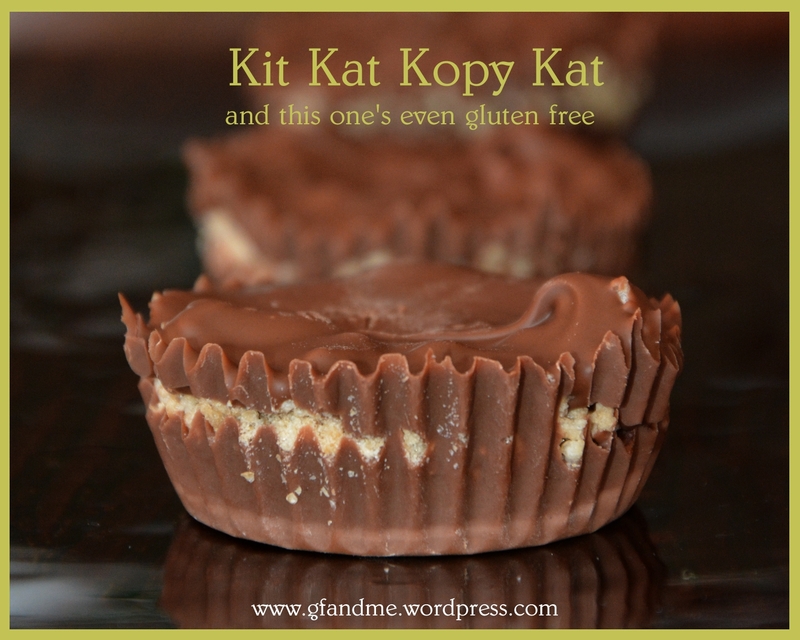 This entry was posted in Baking, Drinks & Desserts, Recipes and tagged candy, chocolate, copy cat, gluten free, nutella. Bookmark the permalink. I hope you don’t mind that I ‘pinned’ a few of your images to my gluten free Pinterest board so I can make your recipes later. Maybe this will bring a few people to your blog as well. Mind! Thanks very much. Hope you enjoy them as much as we do. Those treats look so more-ish! They look kinda gone-ish now! Thanks! These were fun to photograph. Hope the cookies work out! Can’t wait to hear. You’re so welcome and, yes, that sounds like them 🙂 Sometimes mom would press them lightly with a fork – especially the chocolate version – and put half an almond in the middle. The regular shortbread she usually piped through a cookie press and decorated with slivers of maraschino cherries! Honestly, when we were in school (I have a brother and two sisters) she used to make hundreds of these at Christmas! Wow! You guys could go into business recreating confectionary classics! Fantastic recipe. Will have to get my hands on some Chex! Yes, we do seem to have a bit of a theme going, don’t we! Looks so good! Using Rice Chex is a great idea. I wonder if Chex is selling more since they went GF? I eat them all the time and pack them when I takes trips to ensure I always have breakfast! Thanks. Packing gf Chex is a good idea. Geoff keeps some along with a few granola bars in what we call his “feed bag” – a lunch box he keeps in his vehicle for those times when we’re out and just can’t find anything he trusts! thank you. another delicious treat I will be trying! oh my gosh, this is awesome! who cares if it looks like a kit kat, because I bet it tastes like one 🙂 my husband’s going to love this! The trick to getting them to taste exactly like the real thing is to get the chocolate to chex ratio just right. Hope your husband enjoys these as much as we do! Oh do I miss kit kat bars! I’ll be giving this a try! I’m so excited! I was just thinking today how I should find a recipe for Kit-Kats as they are my favorite candy. Now I don’t have to miss them! Sorry I missed these comments until today. Thanks again for the reblog. Much appreciated! Wow! Thanks so much. I thought that recipe was getting more traffic than usual! That was fun reading these. These are super cute! Is rice Chex a bit like rice bubbles? A bit. It’s more like shredded wheat (without the wheat, of course). Rice bubbles would work too though. I don’t know how it will work, but I’m going to try to make these in the molds for ice for water bottles. The “kit Kat bars” will be thin fingers!